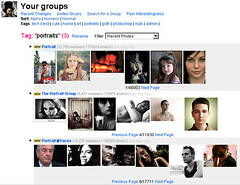 Flickr Show All in Group Pool by User Updated! 9th Apr 2014 :- A GM script that adds a link to let you see all the images in a group pool by a particular user. Flickr Contacts Organiser Updated! 30th Jan 2013 :- A GM script for Firefox that lets you tag your contacts so you can keep up with their photostreams and contact them more easily. 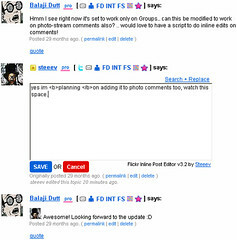 Flickr Group/Forum Inline Post Editor Updated! 24th March 2011 :- A GM script that lets you edit or delete your posts on flickr groups, forums and also photo comments without leaving the page you are on. 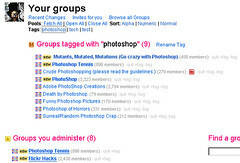 Flickr Group Pool Admin: Warn+Delete Updated! 11th August 2011 :- A GM script that lets you single click to remove images from a group pool, delete all a users images from a pool, also easily mail a user and ban or remove them all from the group pool page itself. 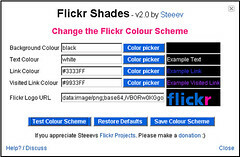 Flickr Shades Updated! 9th Dec 2009 :- A GM script that lets you change the colour scheme of the flickr website, using a handy colour scheme editor. Flickr Group Tracker Updated! 23rd Sep 2009 :- A GM script that lets you track which discussion threads you have participated in. This script was written by Quas with maintenance fixes by Netomer, MHusson + Steeev. Flickr Users in this Photo Updated! 29th June 2009 :- A GM script orignally by Jacobd, with additional code by me, that shows a user icon next to a photo on flickr if that user has been added to the photo with the following user machine tag flickr:user=flickrusername it also adds a select box of your contacts to make it easier to add the user tags. 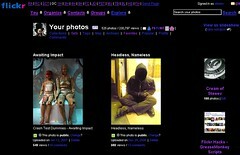 Flickr RSS feeds for individual group/forum threads Updated! 13th Nov 2009 :- A GM script that adds a link to the RSS feed for individual flickr group or forum threads. Flickr Quoter Updated 29th October 2009 :- A GM script that lets you quote people more easily in flickr groups,forums, flickrmail and photo comments. Flickr Titles+Descriptions Batch Tools Updated! 15-May-2015 :- A GM script that lets you edit the titles and descriptions of a batch of images more easily. 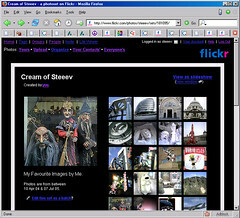 Flickr Quick Links Updated: 9th Oct 2013 :- A GM script that adds user definable links to the top of every page on Flickr. 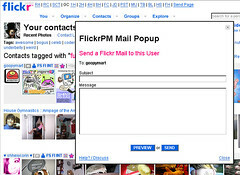 Flickr Mail To :- A GM script that adds a mail icon above photos, and also a "send page" link on every page. Clicking the icon or link lets you email the link to that page via Flickr Mail or regular Email. 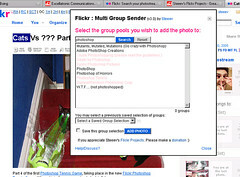 Flickr Group Promotion Tool Updated: 19/8/2010 :- A GM script that adds a select box with pre written comments, allowing you to easily add comments inviting the photo owner and viewers to join your groups. Photobox export to Flickr Updated! 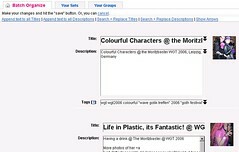 15th July 2010 :- A GM script that lets you export your photos from photobox.co.uk account into your Flickr account. 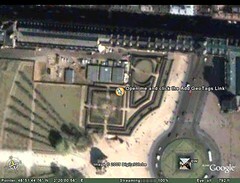 Picasaweb export to Flickr Updated! 15th July 2010 :- A GM script that lets you export your photos from picasaweb account into your Flickr account. Publish Your Faves :- Ive written a couple of scripts (GM+PHP) that let you publish your lists of most interesting/faved/viewed and commented on photos to your website, also lets you publish your list of fave photos by other Flickr users. Flickr - Ho ho ho hats + beards New! 17th April 2009 :- A GM script that re-enables the Ho Ho Ho Hat + Ho Ho Ho Beard functionality on flickr photos all year round. List of Popular International Tags :- I translated flickr's list of popular tags into various languages, in an attempt to find out what the popular international tags are. Flickr Interesting Images RSS feed - Lets you keep up to date with the most interesting images from the last 7 days. Photos of Flickr Users Feed - Lets you view photos of flickr users. Steeev's favourite images by other Flickr users. You can contact Steeev here.